With Captain Fantastic, writer/director Matt Ross has tapped enlightenment like a spigot into a maple tree and funneled it into crowd-pleasing dramedy. With a first-rate cast that includes Viggo Mortensen, Kathryn Hahn, Steve Zahn, Frank Langella and Ann Dowd, Ross’ second feature shows a filmmaker emerging with a booming voice, immediately confident enough to corral such talent into one articulate, sarcastic and smartly realized vision. The result is a righteously comic and deeply-felt examination of a family experimenting with life on the fringes of society. You’ll recognize Ross from his actor’s profile; he’s had roles in American Psycho and The Aviator and more recently has featured on Silicon Valley as titan of industry Gavin Belson; but with Captain Fantastic, he proves he’s learned a fair measure from being on the other side of the camera. He trades between comedic barbs and heartfelt emotionality on a dime, all the while maintaining a steady tone that must tiptoe the fine line between hope and hopelessness, clarity and insanity. The children read well beyond what would be considered their age-appropriate level, learn self-defense with live weapons, hunt and prepare their own food, sing songs in perfect harmony and scale rock faces like it ain’t no thang. Their rigid psychology of life is in the name of fostering independence, agency and intelligence well beyond the scope of Americana 2016. Because of the characters’ almost unconscious tendency to talk down to those who live outside their bubble, Captain Fantastic runs the risk of alienating its audience by arriving with some tacit kind of superiority complex. This fact is most notable in a scene where Ben proves there’s method to his madness to sister Harper (Hahn) and brother-in-law (Zahn). When questioned, the traditional parents’ two video-game-numbed children can’t remember much about the Bill of Rights aside from it being “a government thing” whereas Ben’s youngest Nai (Charlie Shotwell) launches into an analytical breakdown of how such a document defines us as a nation. We’ll credit material like this as being purposefully on-the-nose but it does fosters a faint sense of naivety in assuming that homeschooling knife-fight-style is the end-all-be-all of child-rearing options. And though almost all the children in Ben’s flock adore and respect their omnipotent knowledge bank of a dad, 12-year old Rellian (Nicholas Hamilton) has reservations about their upbringing. He fingers Ben as being responsible for the mental break that drove their mother past the point of no return. There’s a sense of hip absolutism to Captain Fantastic that makes it feel a bit like a fad diet. And like being paleo or vegan, there’s a limited scope to what narrative nutrients one can absorb here. Late in the game, Ben begins to come to terms with the fact that maybe his uber-hippie, no reservation brand of sheparding his children may have given rise to a whole other host of issues (such as their unfamiliarity with Star Trek lore or a brazen overconfidence in bending the law to their will) but, this being a movie that feels the constraints of its movie-ness, it abandons that ripe thread in order to patch together a populist ending. Ironic considering how hard the film tries to escape the path most traveled. Return of the King of the Jungle, er Captain Fantastic, does struggle with ending problems (a la that final Lord of the Rings installment) because it keeps trying to get in one last word. That is, it keeps “But and…”ing itself. And though everything feels a touch too snug and a pinch too smug, Mortensen injects enough humanity into what could have been a comically hyperbolic character. Ultimately he creates a man dealing with the weight of implementing a life plan that might just prove fatal to his progeny and that’s a tough pill to swallow. CONCLUSION: ‘Captain Fantastic’ is the anarchist’s cookbook of indie road movies; a cherry bomb of heart and good humor that blissfully ignores the virtues of normalcy for the ecstasy of experimentation. 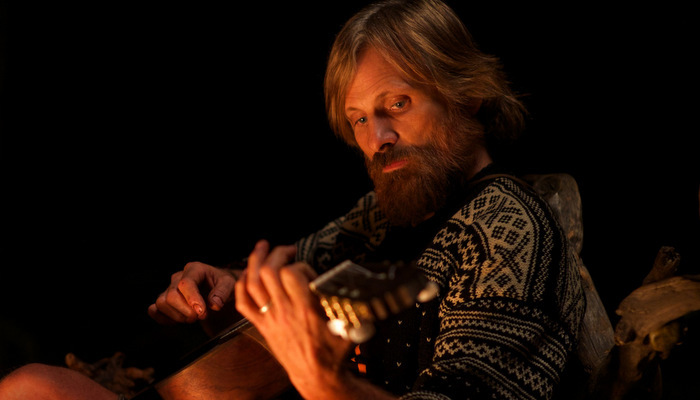 Viggo Mortensen is a powerhouse as a dad living off the land with his six more-than-competent children even when the narrative proves a hint preachy. This entry was posted in Festival Reviews and tagged Ann Dowd, Captain Fantastic, Charlie Shotwell, Frank Langella, Kathryn Hahn, Matt Ross, Reviews, Steve Zahn, Sundance 2016, Sundance Reviews, Viggo Mortensen. Bookmark the permalink.